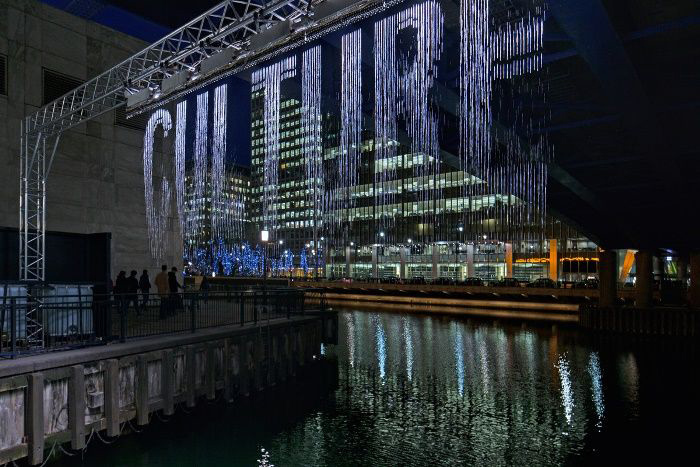 Whenever this artwork is switched on a large audience gathers; the fascinating Bit.Fall is a waterfall creating a cascade of words sourced from live news feeds. The work is a play between the highly technological system and its relationship to nature. The speed at which information is sourced, exchanged and updated in our modern society is almost inconceivable and more ephemeral than ever before; Bit.Fall translates this abstract process into an experience for the senses. The information-curtain acts as a metaphor for the incessant flood of information we are exposed to, and from which we draw our perpetually changing realities. The visual information is only temporarily perceptible as an image before it dissolves into itself. The distribution of information is revealed as a transient, easily manipulated phenomenon. The point is not what we see, it is how we evaluate it. In Bit.Fall, information is represented by words generated by a computer program, based on a statistical algorithm. The program filters relevant terms from the current stream of news on the internet and transmits the values to the control unit of Bit.Fall. In a split second, the machine releases hundreds of drops at specific intervals, creating a ‘waterfall’ of words. Each drop of water becomes a liquid and transient ‘pixel’ or ‘bit’, the smallest unit of information. Bit.Fall combines two distinct circulation systems – circulation in nature (through its own laws, such as gravity) and circulation in culture (through the degrees of social attention as recorded by statistics). Location We originally exhibited a Proto-type for Bit.Fall in a London Bridge railway arch in 2004. In 2010 we installed 2 developed machines; one on the river walkway outside Tate Modern, Bankside, linked to the river tide, the other under the DLR bridge in Canary Wharf. In 2012 a 45-metre machine was commissioned for the Olympic Park during the Olympic Games. Since 2016 a 10-metre machine has been permanently installed under the DLR bridge, Chancellor Passage in Canary Wharf, where it can be seen on Winter evenings. Curated and Produced by Illuminate Productions in partnership with Canary Wharf Group. Supported by Southwark Council, Tate Modern, Arts Council England, Port of London Authority. Key coverage total reach 600 million. Media included: BBC London News, BBC Radio London, The Telegraph, Daily Mail, The Times, The Financial Times, The Independent, The Guardian, Time Out and Metro. Julius Popp is a media artist currently living and working in Leipzig, Germany. After an apprenticeship as a photographer from 1998 to 2005, he studied Fine Arts at the Hochschule für Grafik und Buchkunst, Leipzig. From 2005 to 2009 he was a master-class student of Astrid Klein at the Hochschule für Grafik und Buchkunst. Popp has received several awards including: the Robot Choice Award of the international art exhibition ArtBots, 2003; the Ars Electronica Award of Distinction, 2008; the Kunstpreis of the Leipziger Volkszeitung, 2009; the Silver Design Lion and the Bronze Outdoor Lion of Cannes, 2011. His work often involves technology, resulting in interdisciplinary ventures reaching across the boundaries of art and science. He cooperates with the University of Leipzig, the Fraunhofer Society in St. Augustin, Germany and the M.I.T. Cambridge in Massachusetts, USA. Since 2005 he has been included in various group exhibitions worldwide & solo exhibitions including: Kunsthalle Nürnberg, Oboro Art Centre, Montréal Canada, Kunsthalle Wien Austria, Galerie für zeitgenössische Kunst Leipzig, Konstmuseum Eskilstuna Sweden and National Museum of Modern and Contemporary Art, Seoul South Korea.